You totally misunderstood what the issue is when it comes to black scholars on this subject. It does not matter how or what the ancients felt about race; what matters is that modern day black people understand that we have not always been slaves and relegated to the footstools of society. That we have a proud history that goes far much further back than that; in fact it is pretty much settled science that the first people / civilizations were predominantly black African. This is not meant to be racially self serving as I’m sure many will take it that way, it is simply the effort of black scholars to debunk the myth of white superiority. That is why the skin color of the ancients are in important to black people. First off, I appreciate this translation of the plaque. That said, based on your own assessment and research, if this is from the first dynasty, the odds of terenetjer being anything other than black African are slim to none. As you state yourself, Kemetic civilization first came from the south, west, and east. This is African in origin. While it’s true the concept of race is a fairly recent construct that didn’t factor too much into ancient kemet. 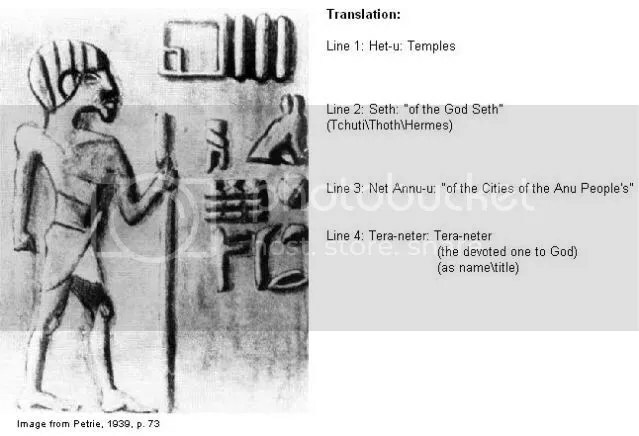 But the main reason it didn’t was because for thousands of years, kemet was fairly homogenous in appearance. Was there a spectrum of shades back then? Likely. But anything from 12 dynasty and earlier were a civilization of brown to near black people. Saying all of that, it’s a little disingenuous of you to go out of your way to break down this plaque to deconstruct what “afrocentrists” have said about it and not be more detailed in breaking down the “complexity” of the ethnic makeup of the people of the area. Trying to equate “afrocentrists” with “eurocentrists” to appear unbias is also disingenuous. There is absolutely nothing European about ancient Egypt. Definitely not in the first Dynasty. So the question is, what is the motive behind all of this? You could have easily described the translation properly without going out of your way to chide African centered scholarship. 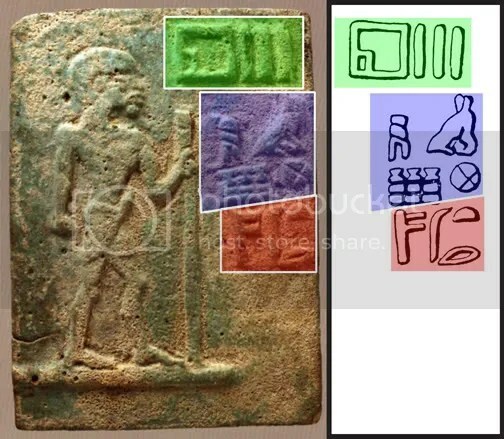 in fact, you could have stated the complexity of ancient Egypt as a whole in terms of racial identity but still acknowledged that this individual represented in the plaque was likely black African. Yet you didn’t. Why? Thanks for reading and commenting, Sb. I can explain my approach only by stressing its narrow focus: a proper critical analysis of this plaque. I openly admit to a dislike of anachronistic agendas, whatever their source. I view both afrocentrism and eurocentrism as equally misguided and historically flawed—but perhaps you and I view the term “afrocentric” in different ways. As I view it from the perspective of my article and the wider spectrum of historical analysis, afrocentrism is an unbalanced or an exaggerated view. The same is true of someone of European descent who claims the original Egyptians came from Europe—which I flat-out agree is preposterous and patently ignorant. It’s altogether possible if not likely that Terinetjer was a black African, and I have no problem with that. But the exaggeration would come in stating he absolutely had to be. The Egyptological consensus is that modern Egypt closely parallels the ethnic demographics of ancient Egypt. To the south were black Africans while to the north were lighter shades of Caucasoid browns, similar to Arabic peoples of today, due to countless waves of migrations from the Levant into Lower Egypt from all the way back to the early Neolithic. Personally I believe that most if not all of the earliest kings who forged the pharaonic kingdom were black Africans, given we know their roots were ultimately in Upper Egypt. And personally, like most Egyptologists, I don’t really care what color the ancients were. They didn’t care. so I don’t. I don’t like introducing modern racial baggage into historical studies, and that is the real problem I have with the inaccurate interpretations I’ve seen for this ancient plaque. My beef isn’t with race. It’s with modern socio-political agendas. Weird that I’m just now reading this. My biggest issue with your approach is that, if we’re being honest, we know that Eurocentrism has dominated how we all have viewed science and history for several hundred years. This socio-political agenda you speak of is not all that modern. it’s only evolved. I agree that there is a recent movement of pseudo science among some Afrocentrists that make unsupported claims regarding people of West African descent being the same as ancient Egyptians or Hebrews or Native Americans. That being said, we’re really talking about a very small segment of people without the power to influence the world. I get not wanting to introduce modern racial baggage into historical studies. But the entire concept of race is based in Eurocentrism. Why focus on the errors in Afrocentric thought? SB, thanks for writing back. And good words. This article is stifled with logical contradictions and is another failed attempt to sully the people of Africa and the African Diaspora. A white man’s inability to reconcile with his place in human history, your argument screams frustration even though you attempt to appear solemn and objective. Furthermore, there is no need to rebuttal the points you lament above which is nothing but white-anxiety cloaked in progressive flimflam. Study long study wrong. Wow, such vitriol. I notice a fair amount of stereotypical afrocentric bluster but, as is almost always the case in such matters, you complain without even attempting to challenge or address any specific point in my article. What is a word-salad of complaints supposed to accomplish? Have you even heard of this artifact before?